Every company needs a writer. Whether it’s writing copy for a website, creating press releases, or editing a book, the need for strong writers who know how to package clear and convincing arguments in an engaging piece is constant. Thanks to its emphasis on writing well, Christendom’s liberal arts education is the perfect launching pad for strong writers. 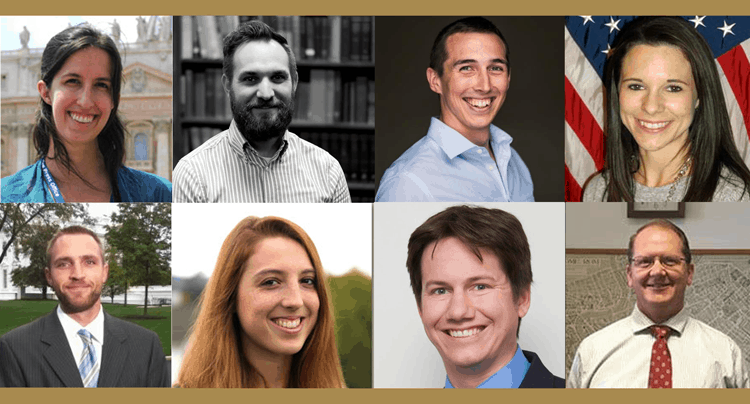 From editorial to journalism and from marketing to public relations, Christendom’s alumni can be found everywhere in the workforce, using their skills to communicate important ideas and impact society for the better. Many Christendom alumni have gone into the communications field after graduation. Top, left to right: Ann Schneible, Christian Tappe, Jeremy Minick, and Amanda Vicinanzo. Bottom, left to right: Matt Hadro, Maria Bonvissuto, Charlie Spiering, and Christopher Wells. In the field of journalism alone, Christendom alumni are in major secular publications to Catholic journals. Alumnus Charlie Spiering ’05 is the White House Correspondent for Breitbart News, reporting on the day’s latest political events and asking questions of the White House Press Secretary at every press conference. In Rome, Chris Wells ’97 works at Vatican Radio, where he works on a twice-daily 15-minute English-language newscast. Both see their time at Christendom as invaluable for their professions, providing them with the critical thinking and writing skills needed to be effective journalists. Those working in public relations use those same skills but for a specific organization’s mission, rather than reporting on the work of others. Public relations specialists and communications directors are tasked with communicating an organization’s brand clearly to constituents, requiring the soft skills that Christendom provides — oral and written communication and critical thinking. Anne Schneible ’04 is the director of communications for Courage after serving as a journalist in Rome, now using those soft skills to communicate the important mission of Courage to the masses. Jeremy Minick ’15 created his own marketing company, Enable, where he personally helps multiple businesses communicate their brands effectively to customers. Matt Hadro ’09 is the press secretary for the US House of Representatives, after working as a journalist for the Catholic News Agency. Amanda Vicinanzo ’10 uses her communications skills as the public information officer for the Stafford County Sheriff’s Office, while Zach Smith ’14 uses them as the public relations specialist at Christendom. Before working for the Stafford County Sheriff’s Office, Vicinanzo was also the managing editor of Homeland Security Today — a position that many alumni hold for other publishing companies. Many have worked at Regnery Publishing, a conservative publishing company in Washington, DC, while others have worked as editors for Catholic publishing companies. Christian Tappe ’07 is the editor of St. Benedict Press, while Lesly DePiante ’04 is the assistant editor for Angelus Press, just to name two. Maria Bonvissuto ’15 was one of the alumni who worked at Regnery after graduation, serving as their editorial assistant and as their senior assistant managing editor. While there, she served as an editor on many works, including those by R.R. Reno, editor of First Things, and by Anthony Esolen. Now, she’s transitioned into working as a marketing associate for Oakcrest School — a position that demands the same communications skills, as she handles their social media and website content, along with writing press releases. 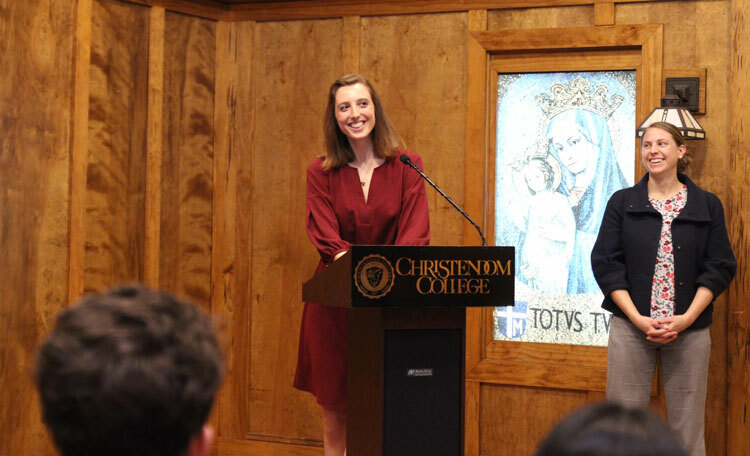 Bonvissuto recently returned to campus for Christendom’s Life on Tap alumni networking series and spoke on how the college’s education helped prepare her for her future in communications. Bonvissuto at Life on Tap with director of career development Kristin Stephens. Students can begin preparing for writing careers while still in school, whether through writing for Christendom’s student magazine The Rambler or taking on a writing internship. Bonvissuto did both, including doing an internship with Verily magazine her junior year. Her time in the classroom and her prep work as an undergraduate served her well in achieving her current success. “If you know how to read and write, you’re already way ahead of most of the people our age. The type of work ethic that is expected of you at Christendom helps you in your future career. Professor Sharon Hickson’s literature classes in particular helped me a lot in learning the writing skills I use today,” concluded Bonvissuto. Christendom exists in order to educate and form lay apostles who can impact society for the better. When envisioning Christendom, founder Dr. Warren Carroll especially hoped to form better writers for society. He himself came from a communications background, writing for Triumph magazine, and saw the crucial need for well-formed writers and thinkers who could write and speak in a clear, convincing, and emotionally engaging way. As a result of that vision, there are now alumni, like Bonvissuto, working as communicators in the world. Words matter and, thanks to their education, thousands of alumni are going forth into society, equipped to bring the Truth to the masses. View Bonvissuto’s full talk at the latest Life on Tap here.